The 2019 Virgin London Marathon will take place on the streets of London on Sunday 28th April. 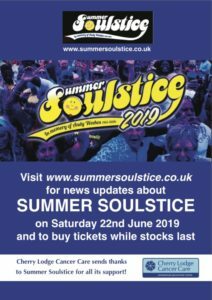 This iconic marathon is a major event on the international sporting calendar and is also an important fundraising opportunity for charities like Cherry Lodge Cancer Care. 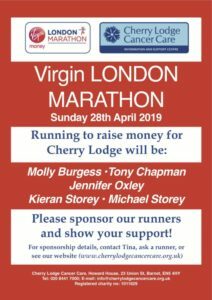 To support our runners and make a donation to help fund Cherry Lodge’s vital services, please visit their online fundraising pages by clicking on the names in blue in the list above. Kieran, Michael and Molly are fundraising together in memory of their grandad. Alternatively, please contact our runners directly, or, for more information about any of the people running for us, please call Tina or Nisha on 020 8441 7000 or e-mail tina@cherrylodgecancercare.org.uk. Our runners would also definitely appreciate your support on the day. Why not go along to the race route on Sunday 28th April to cheer on the Cherry Lodge team and enjoy the fantastic atmosphere? More information about the race, including general advice for spectators, can be found on the Virgin London Marathon website.